This is a busy week. New mattresses were delivered yesterday and the bed frames are coming this weekend. We hope our guests will enjoy the comfortable king-sized beds in the master and guest bedrooms. The kids room gets 2 very comfortable twin beds. I will add photos once the beds are assembled. Furniture is also being delivered this week. We have 2 brown leather sectionals coming -- one for the living room and one for the rec room. The television is set to be installed on the wall, dining chairs are arriving, and the kitchen is being stocked. On the outside, the driveway is getting it's final coat of crushed stone and the land surrounding the cottage is looking less like a construction site every day. But the best news is that the lake is warming up. I am going swimming this weekend for sure -- I'll let you know how it is! Deck outside the Master Bedroom's sliding doors. Walkout from the TV room on the lower level. The outside work is almost completed. The painting is done and the place was cleaned top to bottom. It's starting to look like a real home. There is still a little plumbing to be completed and light fixtures to be hung. I've included a photo of our staircase because I think it looks fabulous! My favourite thing about our property is the view from the deck. The cottage is positioned on a slope back from the water. When you are sitting on the deck, it feels like you are in the treetops! It is tranquil and beautiful. The painting and touch ups are done and all major work on the interior is now completed. This weekend is a big clean-up and then we can start furnishing the cottage. The screened porch was finished today and the storage shed doors are being installed this weekend. More photos to come shortly. Custom cedar doors to the screened porch. The screened porch above and the storage shed below. Final painting and paint touch ups are scheduled for next week. Then the big clean up happens as we are officially out of the construction phase! Finishing touches such as hanging the light fixtures, installing towel rods and drawer handles are on the agenda. Furniture is being ordered. We can not wait to post furnished photos on our website. It will be a very modern and stylish lakeside home. We should be ready to rent in the latter half of June. Heavy machinery is still working outside to grade the lot and install retaining walls. The felled trees are being cut up for campfire wood. We will post updated photos soon! The deck railings have been installed, so now our 65 foot deck is safe and usable. It's quite a view! And it's quite a big deck. The new deck railing. Looking west on Drag Lake toward Spruce Lake. A new 8x16 cedar dock was just put in the water, and it looks fantastic! The lower level of the cottage is progressing. The concrete floors have been polished and look amazing. They will be toasty warm with the in-floor heating system we installed. There are minor details to finish and paint touch-ups to complete inside the house, while outside we are working on the landscaping. The 8x16 cedar dock being installed. Polished concrete floors on the lower level. Iron railings have been installed in the front hall. The exterior of the screened porch is completed. Decks and docks are next on the To Do list! The iron railings have been installed. The exterior of the screened porch is completed. Things are really happening now. The granite was just installed in the kitchen and the appliances are being hooked up. The iron railings in the front hall are ready to be put in. Our screened porch is almost completed. Faucets have been installed, final lighting is being hooked up -- it is all coming together! The screen porch is being completed. The kitchen is almost done. 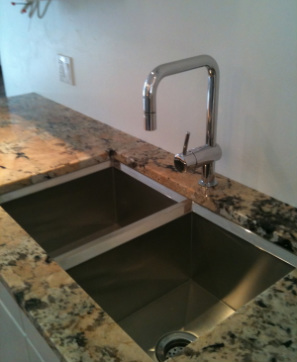 We are loving the deep sink and faucet...and the granite countertops are beautiful! We are in the home stretch! Appliances are being installed, Brazilian granite countertops should arrive soon, and the final touch-ups and clean-up will happen shortly. The front foyer is almost completed. We are just waiting for the metal railing to be made. The walnut railing posts are in. The posts match the walnut doors in the background. Also, the heated travertine floor in the front foyer is completed. The walnut posts contrast nicely with the rough-hewn maple boards on the wall. The kitchen and bathrooms are in their final stages of installation! We should have some finished photos to post by the end of the month. We have completed installing the feature walls in the bedrooms, living room and front hall. Maple trees that were harvested from our lot to make room for the cottage were milled and kilned. Now this gorgeous wood has found new life inside the cottage. The fabulous Caroma dual-flush toilet amid the beautiful Italian travertine tile. Maple harvested from our lot now hangs on the wall in the master bedroom. Drag Lake Getaway will be ready to rent in Spring 2011! This fabulous new construction is currently being finished to the high and exacting standards of its owners. Photos will be posted shortly! 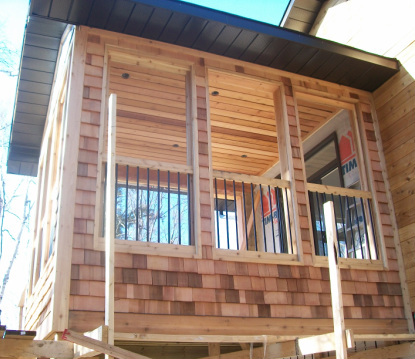 Cedar siding and dark brown window trim look fantastic together.